JRoots is a supplementary secular Hebrew school specializing in a wide range of Jewish educational programming for children ages 3-14! 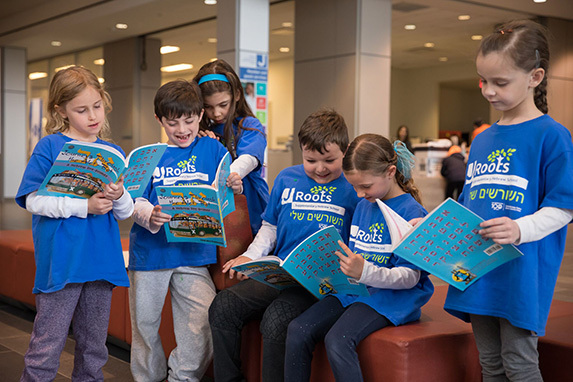 JRoots students explore their Jewish heritage by learning about holidays, traditions, history, literature and developing their Hebrew language skills in small group environments. This learning journey is enriched by interactive games, discussions, creative Judaic expressions, dramatic plays, songs and fun educational field trips. Our mission is to instill an appreciation and understanding of Jewish identity by providing excellent educational practices and materials. It is to promote religious pluralism and to provide a child-centered Jewish learning approach that is inclusive, collaborative and strongly connected to family expectations and child developmental needs. We strive to unify JRooters and build a kehillah! We foster connected Jewish learners in a safe and non-judgmental environment and believe that the unification of the JRoots students and families will help build an innovative, positive, and home-like atmosphere. We strongly believe in the multisensory approach of teaching. Storytelling, dramatic play, arts, interactive games, rhymes, songs and kinesthetic activities will increase the enjoyment level of the Jewish learning journey. At JRoots, we highly advocate for teaching the curriculum and encouraging students to apply it in a variety of ways. We foster understanding through interactive discussions, multisensory elements, and visual aids (Jewish timelines, maps, topic related images, and symbols). The application of learning allows students to truly understand what it is they are taught. At JRoots, we strongly understand the importance of obtaining the best teachers who deliver the program elements to JRooters. JRoots teachers are enthusiasts who truly love teaching and interacting with students of all ages. Our team portrays the visions of the school and helps us to build a fantastic learning environment. Thank you for instilling a love of Jewish culture in my son. Your passionate, kind and educational approach is evident in all you do; from your well planned and executed lessons, to your field trips and community outreach opportunities, my son is thrilled to attend every Sunday! Thank you for providing a safe and loving environment to explore what it means to be Jewish! We have several categories of membership to suit you and your family's needs. Click below to find out about all of our memberships, offers or promotions.